Currently, we are offering a collection service from our local pick-up points. Freighting your item to your local pick-up point is quicker than home delivery. 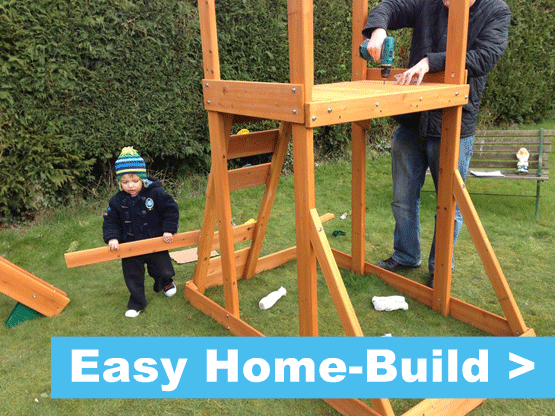 This enables you to have the play equipment home and installed as soon as possible. Ideally, you’ll have a van, ute or trailer for collecting your wooden climbing frame from the local pick-up point. Product box sizes are on the individual product pages. Please note that all product box sizes will vary. A guide includes some approximate details below for sets. We offer home delivery throughout New Zealand (excluding offshore and some remote locations). You can get an instant online quote by simply clicking the “Home Delivery. Get A Quote" link. Enter your state and full postcode. If your postcode is not recognised or the price appears incorrect please contact us and we'll check for you. Due to the size of the products we cannot send climbing frames using a parcel carrier. We have to use dedicated pallet services, so your delivery will normally arrive on a lorry with one driver. We recommend you will have someone available who is able and willing to help the driver offload your play equipment onto your property. Someone 18+ will need to be present to accept and sign for the delivery.